I do startups that involve music… and yet I’m still optimistic. Currently, the Founder and Chief Artist Enabler @ Think Steady Inc. This post is the first in a multi-part series on executing an optimal music crowdfunding campaign, gathered from my hands-on experience at Think Steady Inc. I’ll share a detailed roadmap of best practices, and if you’ll let me, indulge in a few off-the-wall theories on why they work. I’ll be discussing this fuller in person at SF Musictech Summit on Nov. 11, join me! In October of 2012, I wrote a piece titled “Crowd Patronage” in this very blog, theorizing about how early music Kickstarter campaigns were illuminating a path to the new “post-Napster” music industry. The piece did well on Hacker News and a few other outlets, gathering a humble readership of technologists, musicians and music biz types who were interested in such ramblings. Some of these folks asked me to run their artist campaigns, assuming I was a music crowdfunding expert. I wasn’t. This is a re-post from my previous blog, Trackswell. This post has since been re-published by Lifehacker, Hypebot, and CD Baby. Facebook is the largest marketing channel for most musicians and bands. Surprisingly, it’s also the one they know least about. This guide breaks down why Facebook is important, how it works, and most importantly, the steps to make Facebook work for musicians and fans. Artists, you can’t be blamed. Many of you developed your social networking habits on Myspace, Twitter, or YouTube. These platforms are (or were) a lot more straightforward than Facebook. In most cases you post it, forget it, then maybe check the numbers later. Not only do these inattentive social media habits fail on Facebook, they can actually hurt you in a very quantitative way. The following chart is sourced straight from the RIAA year end sales report. It is released every March, and it is the reason you read about the year-over-year triumphs of digital downloads in the face of plummeting CD sales. It is the reason everyone knows that the physical format is dead, the music industry was slow to respond to P2P, and the industry-wide contraction was their price to pay… yada yada yada, I’m not here to beat that dead horse (yet). It’s not the #s that interest me; they’re all predictable data points continuing a decade long trend. No, I’m more interested in the format of the chart. 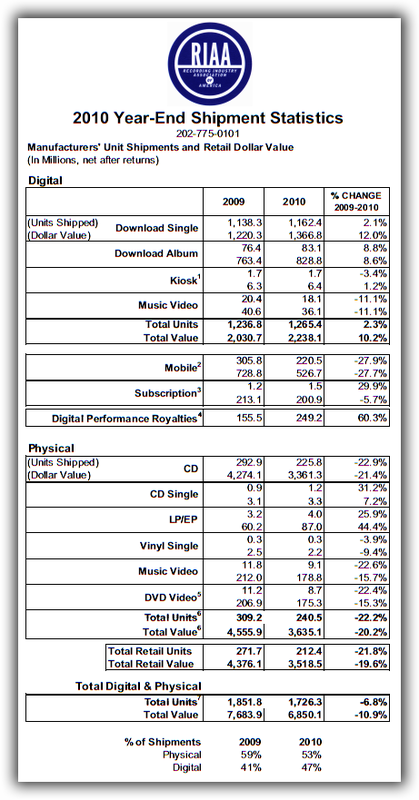 Ever since about 2004, the RIAA has formatted their year end sales summary in the same binary digital / physical layout.